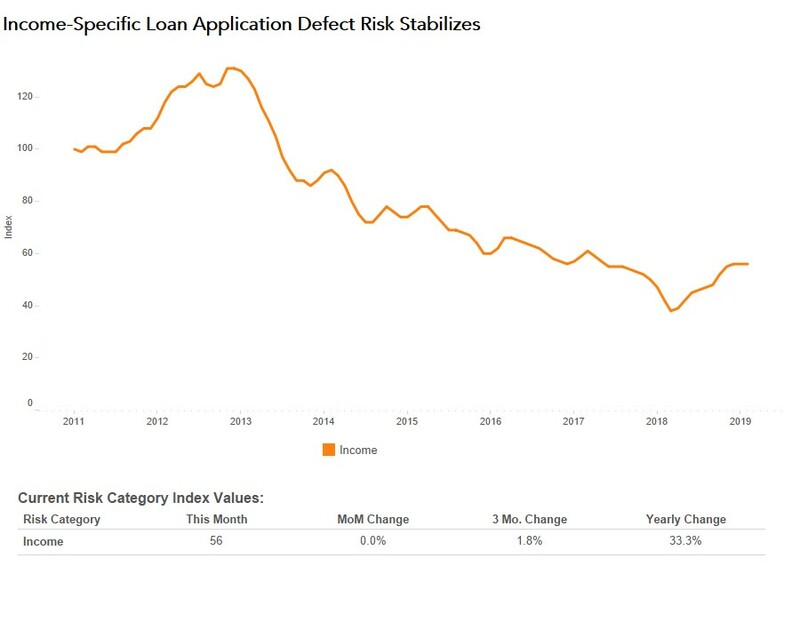 In December 2018, the Loan Application Defect Index for purchase transactions continued its string of month-over-month increases, rising for the fourth month in a row. Despite the upswing, the Defect Index for purchase transactions still remains 1.1 percent below its level in December 2017. The Defect Index for refinance transactions also increased 8.2 percent compared to the previous month and is 14.5 percent higher than a year ago. The overall Defect Index, which includes both purchase and refinance transactions, increased 7.4 percent compared with November, and increased 4.8 percent year over year. What’s Behind the Late 2018 Surge in Loan App Defect Risk? Rising Share of Purchase Transactions: In 2017, mortgage rates were consistently below 4 percent, but rates steadily increased throughout 2018, reaching a high of 4.8 percent in October 2018 before moderating slightly to 4.6 percent in December 2018. As mortgage rates rise, the incentive to refinance declines. The share of refinance mortgage transactions dropped to 27 percent of the overall mortgage market in the fourth quarter of 2018, 10 percent lower than the previous year. While loan application defects can happen on either purchase or refinance transactions, there is a greater propensity for fraud and misrepresentation with purchase transactions. We have seen this before, in 2013, as mortgage rates increased, so did overall defect, fraud and misrepresentation risk. Impact of Natural Disasters: Our research indicates that natural disasters go hand-in-hand with loan application defect risk, as natural disasters create the opportunity for misrepresentation of collateral condition. Unfortunately, this trend appears to be playing out in the aftermath of the tragic wildfires that struck California in late 2018. 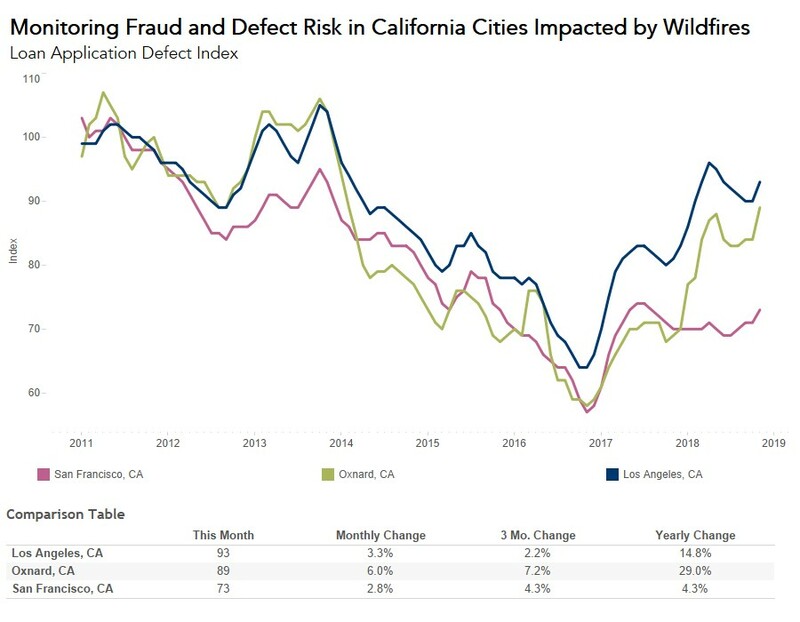 Before July, defect, fraud and misrepresentation risk was declining in California. Since July, California’s defect risk has steadily increased. In California, fraud risk was 14.5 percent higher than one year ago, and 6 percent higher than November. Rising mortgage rates reduced the share of refinance transactions, leading to a greater share of higher-risk purchase transactions. But, as we look forward to 2019, rising rates may also play a role in reducing defect risk. In a rising rate environment, the appeal of the adjustable-rate mortgage (ARM) increases. As mortgage rates increase and borrowers seek to keep their monthly payment low, more borrowers are likely to choose the adjustable-rate option. 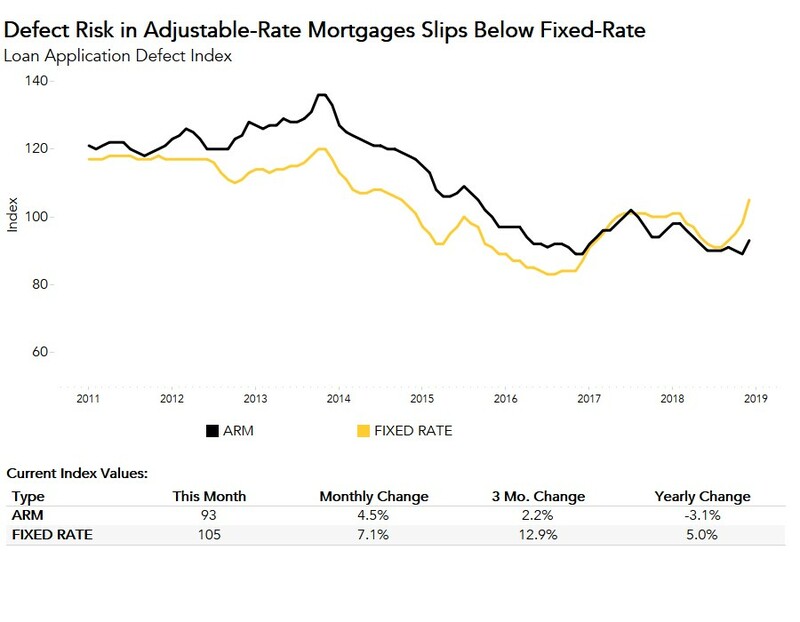 Adjustable-rate mortgages, based on our defect, fraud and misrepresentation index, have been modestly less risky throughout much of 2017 and 2018. 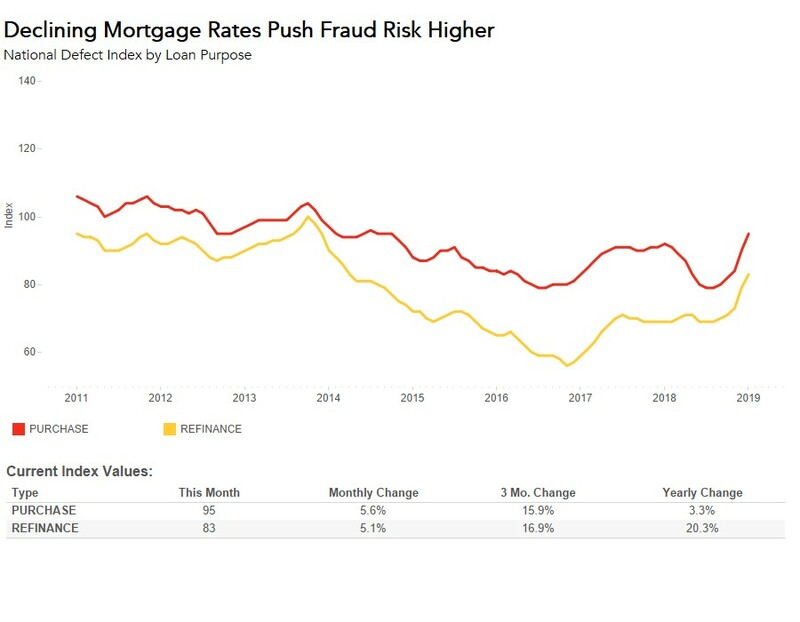 If mortgage rates continue to trend up into 2019, a corresponding increase in the share of ARMs could help offset the rise in risk from the increasing share of purchase transactions. 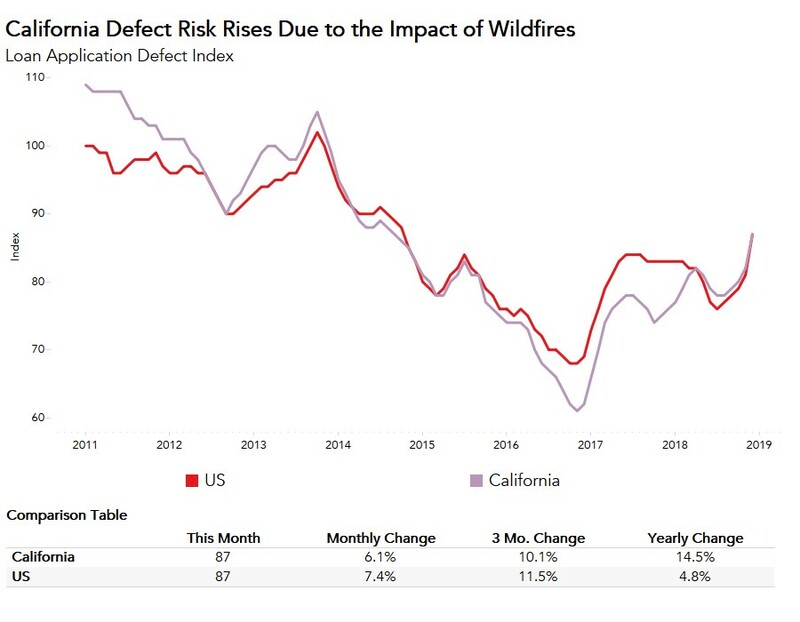 Additionally, data from the 2017 Thomas Fire in California shows that defect risk remained elevated for five months after the wildfire, before trending down again. If this historical trend continues, we expect defect risk in California to normalize moving forward. Therefore, while the rise in mortgage rates and the tragic natural disasters of 2018 elevated loan application defect risk, we have reason to believe that this will stabilize in 2019. The Defect Index is updated monthly with new data. Look for the next edition of the Defect Index the week of February 25, 2019. The frequency of defects, fraudulence and misrepresentation in the information submitted in mortgage loan applications increased by 7.4 percent compared with the previous month. Compared to December 2017, the Defect Index increased by 4.8 percent. The Defect Index is down 14.7 percent from the high point of risk in October 2013. The Defect Index for refinance transactions increased by 8.2 percent compared with previous month and is up 14.5 percent compared with a year ago. The Defect Index for purchase transactions increased by 7.1 percent compared with the previous month and is down 1.1 percent compared with a year ago. The five states with a year-over-year increase in defect frequency are: Alaska (+32.9 percent), West Virginia (+31.5 percent), Maine (+26.1 percent), New York (+24.7 percent), and Hawaii (+21.1 percent). The five states with the greatest year-over-year decrease in defect frequency are: Vermont (-17.4 percent), Florida (-11.1 percent), Arizona (-8.2 percent), Arkansas (-7.6 percent), and Minnesota (-7.3 percent). Among the largest 50 Core Based Statistical Areas (CBSAs), the five markets with the greatest year-over-year increase in defect frequency are: San Diego (+30.1 percent), Pittsburgh (+24.6 percent), Richmond, Va. (+23.2 percent), Detroit (+21.3 percent), and Memphis, Tenn. (+20.5 percent). Among the largest 50 Core Based Statistical Areas (CBSAs), the five markets with the largest year-over-year decrease in defect frequency are: Jacksonville, Fla. (-17.2 percent), Houston (-16.5 percent), Tampa, Fla. (-13.5 percent), Orlando, Fla. (-10.3 percent), and Minneapolis (-10.1 percent).